The first number generated was 11 which is Loris. Congratulations Loris! You have won the Laila fabrics. The second number generated was 44 which is Jessica. Congratulations Jessica! You have won the Scrabble fabrics. Jessica's comment: I am a HUGE purple fan, and I'm currently making a scrappy purple quilt for myself (!) so that's what I would use those FQs for. The Scrabble ones would be perfect for my teacher quilts in progress! You each have three days in which to e-mail me to claim your fabrics. My e-mail is IHaveANotion@yahoo.com. This was fun....thank you to everyone who took the time to leave a comment. 2/2/2011: Edit: I've had several comments that indicate people think I have made the bag posted. I did not make this bag....it is from C & T Publishing. Welcome to my blog, I Have A Notion, my name is Kelly and I'm so happy you came by to say Hi. 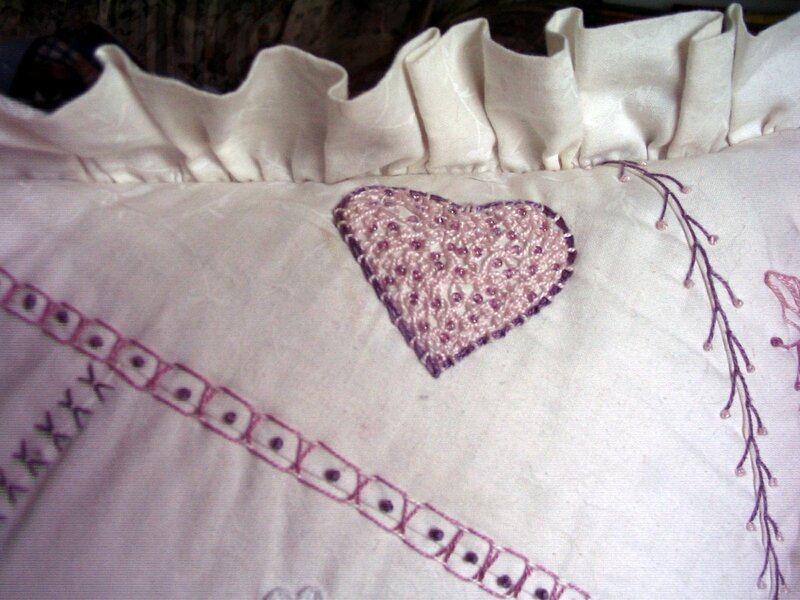 I am participating in the One World One Heart Blog Hop. I live in the US, Ohio to be exact. It is cold and snowy here and we are expecting 12 inches of snow in the next few days....it will be a winter wonderland complete with sledding and snow ball fights (if the snow will pack...we'll see). 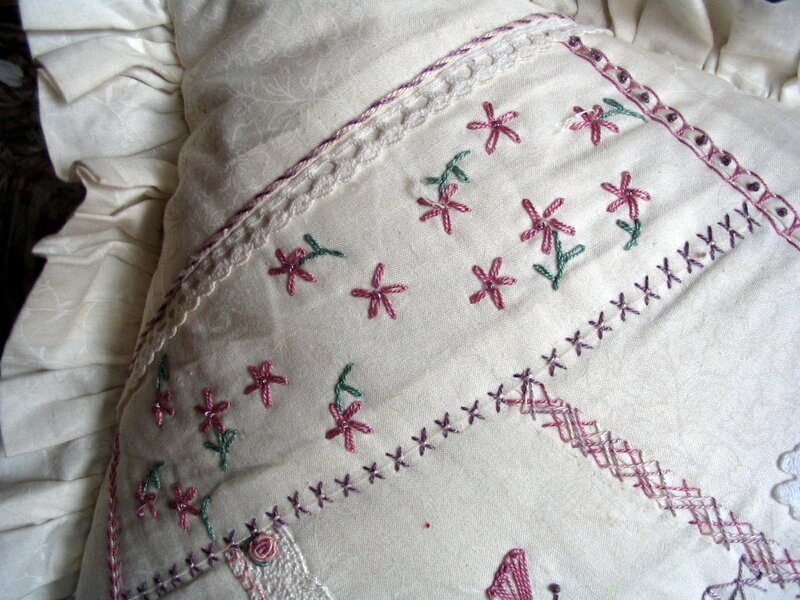 A little about me: I love to work with my hands and I've done all types of embroidery, crochet, quilting, sewing, pottery, scrapbooking, and photography. I love the outdoors and nature.....and being surrounded by loving creative people who support one another in their quest to explore their authenticity. 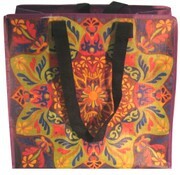 The door prize is this new beautiful Rhapsody Tote Bag (Ricky Tims Design). The zippered tote is made from durable, 100% recycled polypropylene, creating a beautiful new use for tires and plastic bottles that would otherwise end up in the landfill and it measures 15-1/2in x 15in x 8in. Please leave a comment on this post letting me know a little about you and what city, state, province, country you are from. Thank you for visiting and I truly believe we are all connected by this one world/ planet and what we do affects one another no matter how far away we are physically. May you all smile and make our world a more loving and accepting place for all who live here. This giveaway is open to anyone. Four winners will randomly be selected. One winner will win the AccuQuilt GO! which comes with a value pack die. And three winners will each receive a die of their choice for the AccuQuilt GO! Those that win a die should have an AccuQuilt GO! or be seriously interested in getting a GO! as it wouldn't be very exciting to win a die and not have a GO! Oh please....I know many of you have more stash and stuff than any 10 people need or could use in a life time.....get it out....take a pix and swap it with someone. Karen, Sew Many Ways Blog, has extended the swap until Friday. I pulled out some kits and stuff and someone somewhere can use it I'm sure. I'll see you over there, right? 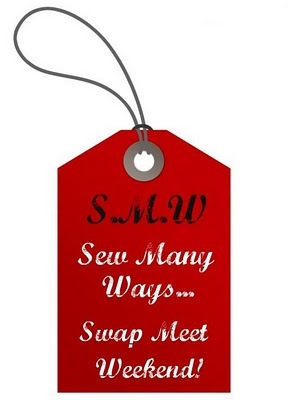 Have you heard of Karen's Sew Many Ways Swap yet? I'm participating and if you would like to click here and you'll be able to join in too! I'd like to swap these 4 kits (complete to my knowledge as I have never opened them, except to take this photo) and a significant amount of fabrics and squares left over from another quilting project. There is enough in the quilting project to make a nice size baby quilt for sure. What do I want to swap for? Good question. I like bright Kaffe Fassett type fabrics, batiks, and interesting sewing notions and scrapbooking supplies. I also like hand made jewelery, things made from paper, hand made in general other than pottery type things...I have lots of that already :) If you think I might be interested, just e-mail me at IHaveANotion@yahoo.com and ask. I'm definitely not interested in pottery, tea cups, etc. It has been 10 years since I have done any Crazy Quilting. I took a class with a wonderful teacher who owns a small shop in MI. 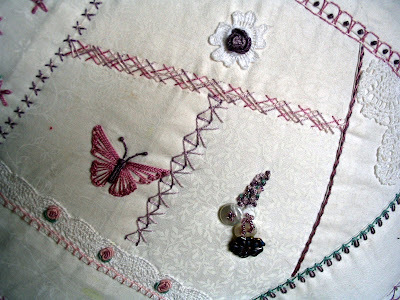 She provided the fabrics and we were to learn how to put together crazy quilting designs and choose stitching for them. When it was finished, I gave this to my girlfriend, Pam. She has always been thrilled with any and all of my hand made gifts. I think the pillow still looks pretty darn good for being 10 years old and having lived through several dogs and cats. Just thought I'd share some stitching inspiration with ya! Today everyone in the 2nd grade had an opportunity to display their inventions for the "Invention Convention." Parents and grandparents were invited to come and see the children's inventions. I must admit when I first read the assignment I thought to myself, "are they kidding me?" Yes, I do have negative thoughts from time to time. I certainly was pleasantly surprised when I saw the value of the assignment and the incredible inventions the children have made. "The Recycle Crusher" invented by an IHAN co-worker. Aaron's "Recycle Crusher" is intended for home use. You put your cans, bottles, paper, cardboard and batteries into the small box. The machine smashes your recyclables into neat cubes to be put into your recycle container in the garage (like a trash compactor). Below are photos from the Invention Convention. Only those children who's parents gave me permission to photograph are shown with faces. The other children's faces have been blurred or cropped for their privacy. I did not get the name of this invention but I thought it was excellent. The back of the robe has a pocket for and an insert to warm and vibrate your back when it hurts. Isn't that cool? I hope she actually got to sew that little robe and pocket. This is the "Pooch Patrol." A robot person that comes complete with everything necessary to play with and clean up after the dog. The orange object on the right side is a squirt gun. A brush, a ball and of course....the poo poo scooper and bucket! I think this next invention is clever too. If we had one of these hooked up to your sewing machines many of us would have smaller behinds....including me. You have to either walk on a treadmill or ride the exercise bike to power your television set. Not only is the idea great but I love seeing it made out of Lego's. I could wear this next one while stitching....but of course mine would provide chocolate cookies....negating the use of the previously mentioned invention. The "Automatic Clothes Folder" is a definite must in my household and I'm glad I know who invented it because I'm going over to their house to buy the first one that comes out of the factory. Just remove the towel and it is ready for the kitchen drawer. I'm thinking I need a robot to do all of that for me too. The "Dial-a-Doo" made me laugh out loud. Unfortunately I did not get the best photo of this one. It is a red had and you set the dial for how you want your hair done and it does your hair for you. What else but a chocolate kiss. There was a line of children to spin his wheel for the chocolate. I saved the absolute best for last. I walked up to this young man and asked what his invention was and he went right into the description without a seconds hesitation. This is "The Mail Indicator 3000" and it lets you know when your mail has arrived. "The Mail Indicator 3000 helps you to avoid superfluous and unnecessary trips to the mail box." That is an exact and direct quote. I ran for a piece of paper and a pen to write it down....talk about a Readers Digest moment. I was obviously tickled and was soooo glad I had the opportunity to go today. Superfluous....and unnecessary trips....well...there you have it.....a second grader with a vocabulary to be proud of! There were so many more that are not included here....all of them were wonderful and imaginative. I hope you have smiled and perhaps giggled....it is moments like these that keep me filled up. Seeing all the little handwriting and drawings.....the smiling faces and the missing teeth......my heart is still singing. If you would like to win one of these stacks please leave a comment on this post and tell me what you think you'll make with them. Remember, we are all entitled to change our minds...lol. This is going to be open to Blog Followers only. It pays to follow the IHAN blog!! The drawing will take place on Monday, January 31st. Good luck! Only one entry per follower please. Hold on to your seats because what I'm about to show you will either cause you to jump from your seat....or fall off...lol....depending your your personal style and taste. I recently had a need to get some pattern inspiration to work on a project I'm in the process of finishing (more on that later). It is a darn good thing Waldo had purchased, "Australian Spirit"and all these amazing great fabrics from M & S Textiles. There are a variety of designers who have their patterns included in this book including; Yolanda V. Fundora, Sara Miller-Moe, Momo Lohani, Susan Deal, Cheryl Phillips*, Jayme Crow, Terrie Kralik, Diane Ricks, and Barbara Campbell. Click on each person's name to read more about them individually. Very interesting and talented ladies. I've had the great pleasure of meeting Cheryl Phillips so it was a great thrill to see her work in the book. Here are some close ups....hang on tight....this is where it gets exciting.....just think of all this amazing creativity. The patterns in this book are excellent even if you were not using the AU fabrics....they are interesting and a nice diversion from traditional patterns. The one I used for inspiration is by Terrie Kralik and it is titled, "Sacred Orb." I read the instructions which were written well and I understood the directions. I did not use the pattern exactly and I'll share that with you more later. It is rare that I like every pattern in a quilt book. Typically I like one and if I'm lucky two or three. I was surprised to say that each pattern appealed to me and not just for use with the Aboriginal Fabrics (although those are spectacular!!!) but for other fabrics as well. More about my quilt soon. It is spread out on the bed to try to get some of the wrinkles out so you can see the designs better. Impressive isn't it? 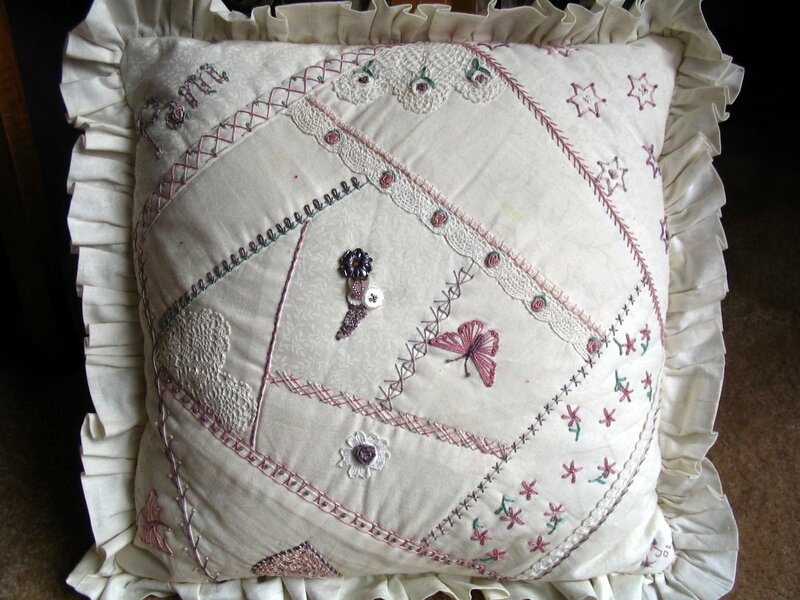 Now what would you say if I told you it is 100% needle turn applique? Every one of those pieces cut out by hand? Yep, I thought that is what you would think....I was thinking the same thing! Do you think it will be machine or hand quilted? And this is another one that just so happened to be finished of recent. 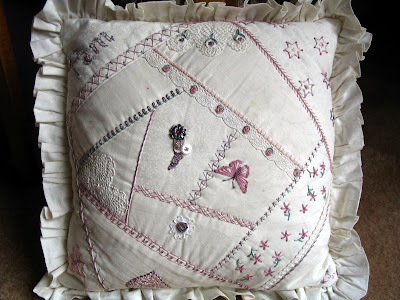 Yes, 100% needle turn applique and hand quilted. 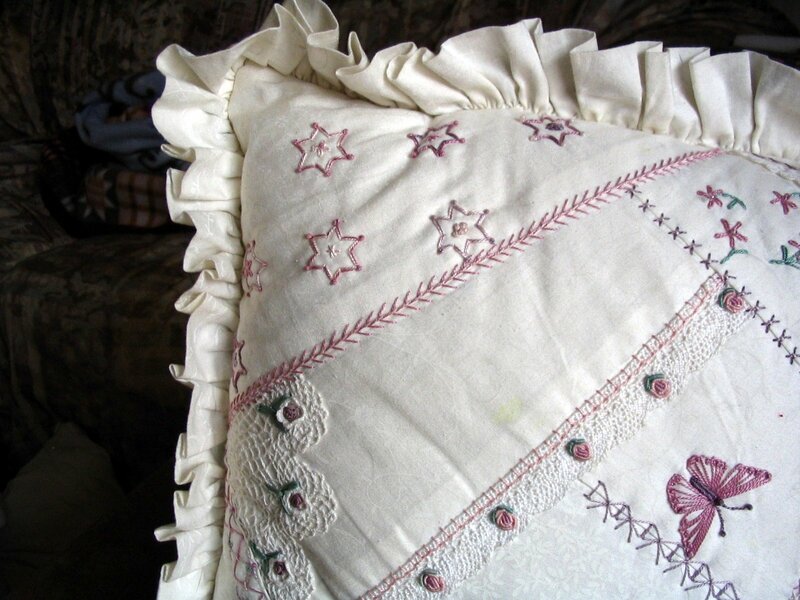 Machine quilting would do no justice to works of art like these. Needle rocked quilting....by hand....the entire quilt. And here is the "Queen of Needle Turn Applique and Hand Quilting" my dear friend, MJ!! If you are going to learn something, ya might just as well learn from the best ay?